Yes indeed – it’s just about time for the Teaser – can you believe it’s been a whole week since we got ready for a Teaser photograph here in geography class????? Time sure is flying by isn’t it? Well I guess we’d better GET TO IT! First of all, you must know that we have a GUEST TEASER tomorrow – yes and don’t groan – I know you worry about those more than if I’m using one of my own BUT think positively OK? I thought the Prof said NO GROANING!!!!!!! Thanks Sarge. I think you put the fear in the class and I won’t expect any further groans. Even from Bobby who has his hand raised in the back of the class – YES BOBBY? 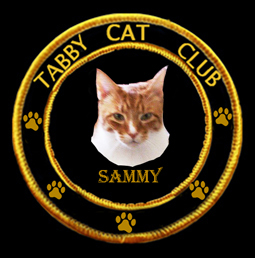 Sorry Professor Sammy but Sarge yelling at us made me need to use the litterbox! You’re excused Bobby. Remember to wash your hands please. ANYWAY – WHERE WAS I – oh yes. It’s a Guest Teaser photograph AND also remember that it will pop up at a DIFFERENT time from my usual daily post – it’s a surprise – that’s so we might catch everyone off guard – sneaky huh? You know you want it, so PAY ATTENTION to your computer/iPhone/iPad, WHATEVA so you see when the post arrives! Suzie would you like to cheer everyone on for tomorrow or are you “saving yourself” for tomorrow’s class? But today you’re lucky I’m just plain HERE! OK – we’ll get full cheering service tomorrow – thanks Suzie. Remember we have badges for other prizes tomorrow too associated with the Teaser AND that you must guess the name of the city/town/village as well as the country (if not in USA) or state (if in USA) where the photo was taken. That’s right – we want the whole thing or ELSE. Before you ask me – YES this is going to be a TOUGHIE! So I’ll see you all back here in class bright and early-ish in the morning right? RIGHT? ANSWER THE PROF YOUZ GUYZ! OR the details, the BACON HARVEST is coming! CLICK HERE for the scoop! Sunday is the day we contribute a selfie of one of us to the Kitties Blue (The Cat On My Head) Sunday Selfie Blog Hop. Lately I’ve let my little brother Teddy handle selfies – after all, now that I’m at the Rainbow Bridge I’m not available for photo-taking (!) and Mom has her hands full keeping up with Teddy who is growing like a little ginger weed. So, today is no different. Teddy is the STAR and I’m happy to have him be that……I’m a “star” in my own right since I’m up in the clouds at the Bridge anyway shining brightly for my Mom every day and night. If you’d like to join the Hop, please visit the Kitties Blue by clicking on their badge……it will take you there and you can load up your selfie using the LINKY tool! My little brother….sparkling brightly! Love you Teddy….. Guess Teddy and I have “sparkling” in common!!!!! Every Friday we pawticipate in a co-hosted blog hop courtesy of 15andmeowing and McGuffy’s Reader. Each host provides all of us with TWO sentences with blanks and WE get to fill them in. 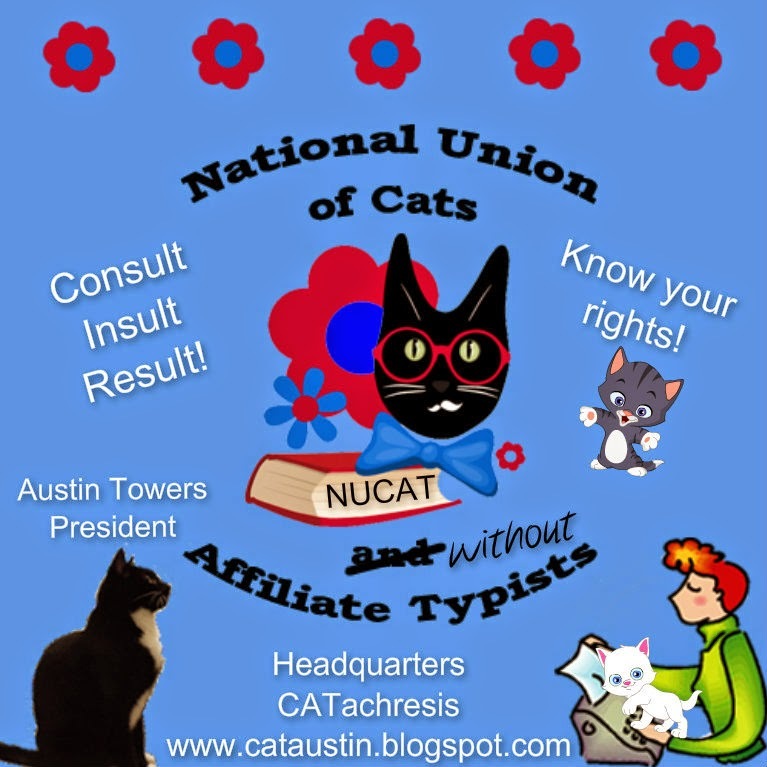 It’s tons of fun learning stuff about each other and if you’d like to pawticipate, just click the badge below and go to McGuffy’s Reader – use the LINKY tool to enter your blog address and post your blog with your OWN words in the sentence blanks!!! Coolio right? Right! 1. The oldest item in my home is a quilt which was given to my Mom and Dad as a wedding gift in 1946. 2. The oldest item in my refrigerator is a bottle of chardonnay that has been in there 3 weeks (it might end its’ stay there tonight!). 3. My family heritage is Irish and English. 4. My favourite family tradition is having sausage gravy and biscuits on Christmas morning (a tradition my Dad started when I was a little girl and when he passed away my sister-in-law and I continued the tradition!. VOILA! Done for another week. Thank you ladies for hosting this fun hop though……..we look forward to it every week! Here are some current photos of my baby brother Teddy………I say baby but he’s one year old now so purrrhaps I should just say “my younger brother” now? Nap time with his new catnip heart he won from Cat Scouts! Sound asleep in his new tent cube……the boy likes to stretch out – what can I say? He’s actually AWAKE! Imagine that! Now indulge me for a minute while we tell you about one of the most wonderful craft shops on Etsy for pet peeps! 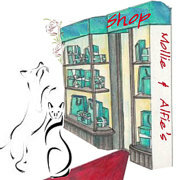 It’s Mollie and Alfie’s shop and their Mom Miss Stella makes EVERYTHING in the shop with love. Can’t get better than that right? My Mom has a LOT of things from the shop that Miss Stella has made……………and even though it may take a while to get some of the personalized things like figurines – when you DO get your item(s) you will be SO PLEASED at the quality and the FUN that’s built into each item. Trust me. 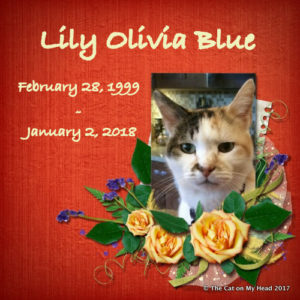 When I went over the Bridge in December two of my Mom’s BESTIES, Miss Sharon of Friends Furever and Miss Stephanie of Goodness Gracie made SPECIAL arrangements with Miss Stella for her to do figurines/ornaments of ME. Miss Sharon asked Stella to do a figuring of ME in my Cat Scouts uniform and Miss Stephanie asked for an Angel with wings of me. These beautiful and thoughtful gifts were from them for my Mom. Mom was so thrilled to learn of this sweet gesture and even though Miss Stella was up to her eyeballs in Christmas orders and SUPER DUPER busy, she promised to get them done and sent off to Mom. So take a peek at her ETSY store…………………….bet you’ll find a perfect gift for YOU or for someone else who has a pet they love………..or even “just because” !!!!! THANK YOU STELLA, MISS SHARON AND MISS STEPHANIE for your kindness…………you made my Mom VERY happy! Just CLICK the SHOP BADGE below and start shopping!! ALSO – Happy Saint Patty’s Day! And this is Nellie and ME from her blog post today as leprechauns! It’s Double Post Day Again! One blog post for two occasions………Brian’s Thankful Thursday and my very own Thoroughly Poetic Thursday. So let the fun begin………..first with Brian’s Thankful Thursday – the badge below will whisk you away to his blog if you’d like to join up with this blog hop and talk about what you are THANKFUL for…….I’m thankful that even though my little brother Teddy is slowly taking over the reins of what used to be “my” blog, and some of “my” duties like KING OF BACON – I can still not be jealous but instead be PROUD of him for carrying on the traditions that I started. 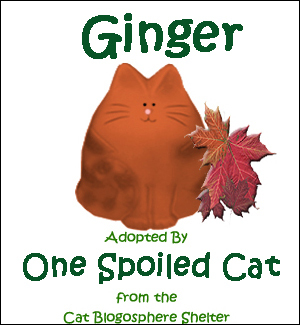 Teddy is a super sweet kitty and he wears his “GINGER” very well if I do say so myself! Part Two of today’s post is my poem of the week……………! We are up to the letter “N” of the alphabet slowly working our way to Z ! 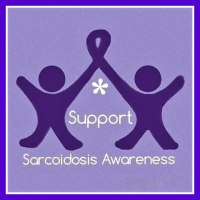 You can join in by putting your blog link with your poem in my comments to share OR just write your poem in my comments and we’ll all read it here! But at the end of your ride, it will be worth it all. You won’t look beyond the clouds at the beautiful blue sky…..
You might pull out in front and WIN your life’s race! Hey Sammy, that was a swell poem! I promise I will NEVER say NEVER! But I do want to remind our blog friends that this Saturday we will have more information on the upcoming BACON HARVEST PARTY………..details and some “photo op” shots that those of you who want to pawticipate in the party can use to put yourself in the action! You’ll see what I mean Saturday so STAY TUNED. We’re going to have a fabulous time! 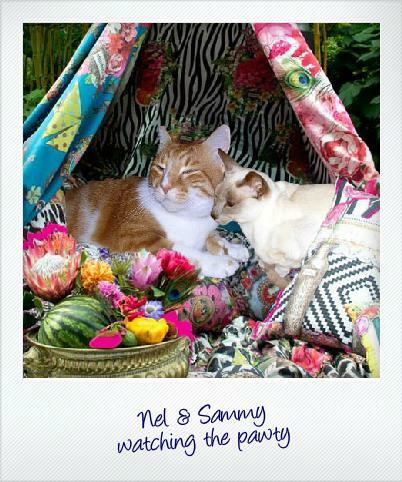 How could it NOT be fabulous – the Ginger Boys are at the helm of the GOOD SHIP BACONIA! I thank everyone for joining us today for our DOUBLE POST Thursday! Welcome back to the place where you can find out WHO wins WHAT on this week’s Teaser! I was actually very surprised that the First Right Guesser came a knockin’ on the door SHORTLY after the post went live yesterday morning. I thought it would be a bit of a toughie and so did the person who sent the photo in to us as a Teaser Conundrum. Shall we give you all the info? Oh yeah – lets! The Teaser photo was from the Kitties Blue (The Cat On My Head) and it’s a great photo of the Luzhniki Stadium in Moscow, Russia! Kind of an exotic thing right? Cool photo Kitties Blue – and to thank you for sending it in, here’s a badge for you! Who was FIRST to make a comment on yesterday’s blog? Well, let me back up a bit to tell you that when we went live at 7:45 NOBODY was there – I think it was the first time in FOREVER it took a couple of minutes for someone to chime in and comment. I think because of the early posting time it was too early for there to be a lot of Teasers-On-Duty right? HOWEVER, after about 2 or 3 minutes someone DID comment and who was that someone who wins the FIRST COMMENTER badge this week???? So we had winners and we had fun – just like we ALWAYS do on Tuesdays right? Make sure you are here next Monday for Pre-Tease Monday because if you aren’t here, Sarge might get angry. You know you don’t want that to happen! It’s that time again………..TUESDAY and time to tease you! Today’s Teaser photo is a GUEST TEASER photo………….and tomorrow you’ll find out WHO submitted it as well as WHERE the photo was taken. My personal feeling on this one is that it’s TOUGH…………..I hope you find it tough too!!!!!! Before I show the photo – a reminder that the FIRST PERSON to comment on this post will get a FIRST COMMENTER badge – you know you want it so go comment now then come back! Hurry! HURRY – THE PROF SAID HURRRRRRRRRRY! Coolio right? Right! NOW ON WITH THE SHOW…………………..shall we ask Suzie if she’s in the mood to cheer everyone on today? She squeezed out a fairly “tame” cheer yesterday but can she do it two whole days in a row? Let’s roll the dice and see……………….(gulp). So you think I should be TAME? That rarely brings the FAME! And I’m NEVER, EVER snooty! AND YOU’RE A REAL CROWD PLEASER! C’mon and don’t be a DRAG! OK thanks Suzie…………………….I think……………………you won’t find any drags around here – we’re all excited about the Teaser and can’t WAIT to see who wins! So let’s get Mr. Silver Briefcase in with the photo OK? WHERE DO YOU THINK THIS PHOTO WAS TAKEN??????????? I need to know what town/village/city and what STATE (if USA) or COUNTRY (if not USA) this building is located in………..got it? If you don’t guess city and state/country then you won’t win! Now – get to guessing you guys – let’s see WHATCHA got!!!!! Tomorrow we’ll have the TEASER TELL ALL and you’ll find out who wins what AND who our Guest Teaser is! Professor Sammy my Mom says I can tell SARGE to buzz off if he yells at me again….I just wanted you to know that! Bobby I suggest we do NOT put this to a test…………..Sarge is not the kinda guy to take kindly to being told to “buzz off” !!!!!!! Hugs from Angel Prof Sam and the Teddy Guy! Happy Monday and if you’ll take your seats at your desks, we will get started with our Monday Pre-Tease class………..first of all, please remember that our TEASER post tomorrow will be popping out onto the airwaves at a SURPRISE time…………..not our usual time……………makes things more interesting that way! When it arrives, whoever is the FIRST to comment on the post gets a swell badge. Now isn’t that exciting? Of course it is! Professor what if NOBODY comes to the Teaser post tomorrow……has that ever happened???? No Bobby – happily we’ve never had NOBODY show up on a Teaser Post day or for that matter any OTHER day in all the years I’ve been teaching class here. So you don’t have to worry about that. SOMEONE will be First Commenter, someone will be FIRST RIGHT GUESSER and there will be other RIGHT GUESSERS and we all know that there’s never a shortage of people qualifying for the GREENIE – all you have to do to get THAT one is be wrong on your guess! Now, let’s see if our resident cheerleader Suzie might step into the classroom and give us a rousing cheer to get everyone in the mood for the TEASER tomorrow!!! NOT to eat some bon bons! Or else they’ll be the WORST! That goes for you too Teddy! No giggling in class or ELSE! Alright students, thank you for paying attention today – and I wish each and every one of you a happy Monday – I’ll see you BRIGHT AND EARLY for tomorrow’s Teaser! Happy Sunday! It’s Time for Selfies! Every week we play along with Kitties Blue at THE CAT ON MY HEAD and add our Selfie into the mix……….everybody likes to “strut their stuff” and Sunday is the day to do it. Just click on their badge and go there to use the LINKY tool and enter your blog link to join in the FUN! Again, I let my little brother Teddy handle our Selfie entry……….why? Well he’s very photographable (!) and besides, now that I’m an Angel, it’s only fair that HE be the “main star” of the blog. Oh don’t get me wrong – I’m not going anywhere – but Teddy is the new “force to be reckoned with” around here and I want to give him his AIR TIME! Happy Sunday from ME and the Teddy Bear Boy!